What should we do past the point of receiving Jesus? Everyone has opinions, even non-Christians (How many times have you heard, “If you were a real Christian, then you’d ____________,” or some similar wording?). The subject gets even more complicated as we factor in all the differing emphases of various Christian denominations. Paul simplified the whole thing by subsuming it all inside of one great pursuit: “As you have received Christ Jesus the Lord, then walk in Him” (Col. 2:6). According to the apostle’s way of thinking, this involved going deeper (“rooted”), and higher (“being built up”) in Christ. But just in case “Jesus” meant just any nice or religious thing to the causal reader, Paul added that this was the faith “you were taught” (2:7). We aren’t supposed to create another Jesus, but to grow deeper and higher into the authentic One that we received. There is a warning in the next verse about not being taken captive (2:8). Because when you’re finally willing to grow—which for some of us takes years to decide—you’re vulnerable to “faith-jacking.” That means being lured into philosophies that are really just alternate views of Christ. The problem is not merely academic. Attached to every particular version of Jesus is a Christian life, for better or for worse. The Colossians bought into a Christ repackaged as a bizarre hybrid of earthly Judaism and New Age Gnosticism. The outcome was worse than just being wrong. Sick characteristics began showing up in their Christian lives, such as concerns with ceremonial ordinances, mystical ideas, and delusional spirituality. Our takeaway in 2011: don’t mess with Jesus. 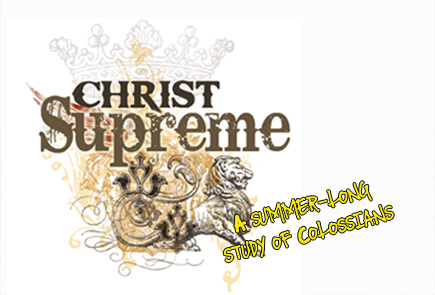 If you go down the Colossian road of adopting a Christ optimized for popular consumption, then your Christian life will look like a bad Jerry Springer episode, but won’t look much like the New Testament. Paul wrote that in Christ “the whole fullness of deity dwells bodily” (2:9). You can’t get better than that. Happily, if that is the Christ to which you’re hooked up, the result will be “You in Him are made full” (2:10). In this sense, “full” means complete, perfect. Ever try to improve on perfection? You’re doomed to mess it up. Try improving on 1 + 1 = 2. Try “fixing” the Mona Lisa with Photoshop. You’re sure to get a mess. What is it about being fulfilled and complete that we just can’t stand? Our primal parents in the Garden of Eden quickly tired of happiness and chose death and pain. Apparently, they thought they were improving the situation. Likewise, “the powerful working of God” is in Christ (2:12). But human beings stand by Him with a red sharpie, ready to adjust Him however they want. We’d like Him nicer. Or we want Him meaner. We’d prefer a Jesus who is more Republican or One who rubberstamps liberal causes. There’s the Jesus who enjoys mocking the failures of the church or who is a spirit guide or gun lobby advocate. There’s Jesus the quintessential American, or the moral crusader, or inventor of western Christianity, or simply the fan of all things religious, no matter how wacky. We find out sooner or later, though, that while we might try to borrow the power of the biblical Christ and import it into our preferred version of Him, something always gets lost in translation. Better to stay with the original often copied, but never duplicated Son of God. That’s where you find the fullness. That’s where you find the power. Col 2:6 – Therefore, as you received Christ Jesus the Lord, so walk in him, 7 rooted and built up in him and established in the faith, just as you were taught, abounding in thanksgiving. 8 See to it that no one takes you captive by philosophy and empty deceit, according to human tradition, according to the elemental spirits of the world, and not according to Christ. 9 For in him the whole fullness of deity dwells bodily, 10 and you have been filled in him, who is the head of all rule and authority. 11 In him also you were circumcised with a circumcision made without hands, by putting off the body of the flesh, by the circumcision of Christ, 12 having been buried with him in baptism, in which you were also raised with him through faith in the powerful working of God, who raised him from the dead. 13 And you, who were dead in your trespasses and the uncircumcision of your flesh, God made alive together with him, having forgiven us all our trespasses, 14 by canceling the record of debt that stood against us with its legal demands. This he set aside, nailing it to the cross. 15 He disarmed the rulers and authorities and put them to open shame, by triumphing over them in him. Next Post: Put on the new.